Rock has not created a new standard with this album, but he has created an alternate universe, reminding us that hip-hop can still be anything we make it. Ever wish we could have a do-over? Just start hip-hop over again from the beginning, but with everything we’ve learned since? 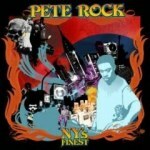 Pete Rock’s newest solo album NY’s Finest plays out this fantasy 16 bars at a time. Starting off with the voice of a 1970’s blacksploitation/black power sista annoucing that “This is some bourgeois bullsh*t!” and interspersing the voices of revolutionaries and street corner preachers, this album asks: what if hip hop had stayed true to its roots in the soul movement, its commitment to fight the power structure and its ethic of making music for the love and the respect of your neighborhood? What if no one ever sold out? Pete Rock, most famous for his memorial "They Reminisce Over You (T.R.O.Y. )", which he produced as part of the duo Pete Rock and C.L. Smooth, imagines hip hop as a profession with a guild, and longevity, where he can “keep rocking ‘til I retire” instead of getting shot down in scuff-free sneakers. And to be clear, though the album uses the nickname “New York’s Finest”, invoking the New York Police Department, this album is anti-police from start to finish, except when Pete Rock and the emcees he’s gathered become the hip-hop police, lamenting “bubble gum rap” and insisting that there is still hope for authenticity somewhere. Pete Rock frames himself as a “Made Man” explaining that credibility comes from a lifetime of building skill, not 15 seconds of threatening to kill everyone. And everyone, at least everyone in New York, is down to jump in Pete Rock’s time machine and give hip-hop another try. While Pete Rock doesn’t stand out as a stunning lyricist, he certainly inspires good company. The album starts with “We Roll” featuring the most recognizable and marketable New York voice of the moment, Jim Jones, but the true victory of the album is that Pete Rock was able to gather a brilliant lineup of emerging and veteran artists to join him in the journey. Redman, Styles P, Little Brother, Raekwon, Lords of the Underground and many more make appearances on this album and co-sign Rock’s vision. On “Ready Fe War”, featuring Chip Fu and Zhane’s Renee Neufville, Rock reminds us that reggae and rap grew up in the same Afro-Caribbean diasporic speaker sets in New York City, with the same oppositional stance and vision, to get the people ready for a struggle. And “That’s What I’m Talking About” featuring Rell, makes sure there is at least one R&B hook for the lover in you. But the treasures on the album are back to back, already marked by a groove on my copy. On “Bring Y’all Back”, Pete Rock teams up with Little Brother, the Durham-based protoges of Rock’s heavy backpack style to theorize about the essence of hip hop. "If the words didn’t rhyme, would it still be rap? If the needle didn’t grind could DJ’s scratch? If it you didn’t have no verses would you need my tracks?” This set of completely rhetorical questions along with the low brass (a tuba maybe?) march of the beat, slows the momentum of hip hop and breaks it down into its elements, attempting to ignore the inevitability of a rap economy, to bring the hip hop community back to an original desire to create. By far the best track on the album is the long-awaited return of The Lords of the Underground in “The Best Secret”. Lyrically and instrumentally, this track deserves at least three consecutive plays. The Lords of the Underground take their place as royalty in the world of what hip hop should be. Their voices complement the piano jazz and snare beat, adding all the bass they need to start “movin’ through your body like adrenaline.” There is no reason for this track to remain a secret for long. Throughout, Pete Rock gives the listeners what they came for: his beats, grounded but lifting off with an outerspace tendencies, highstepping with snare or petering off with synthesized tail ends. “Comprehend”, featuring Papoose, ends the album with the disorientation that the barely integrated vintage interludes and the plethora of feature artists nutured all along. Where are we? When are we? Rock has not created a new standard with this album, but he has created an alternate universe that reminds us that hip-hop can still be anything we make it.